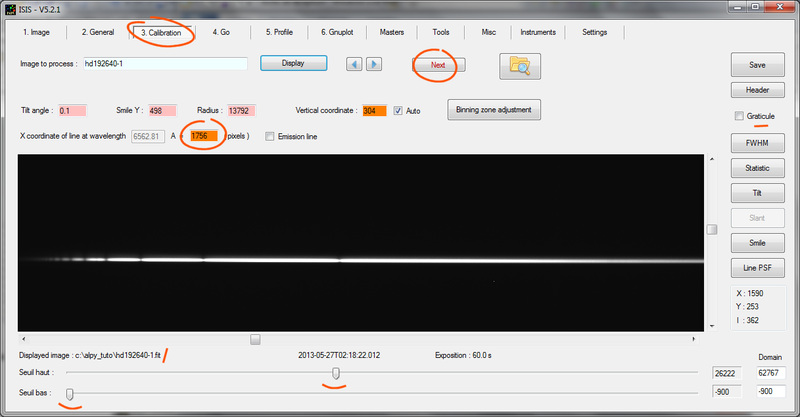 This tutorial concern profile extraction of spectra taken with Alpy 600 spectrograph. 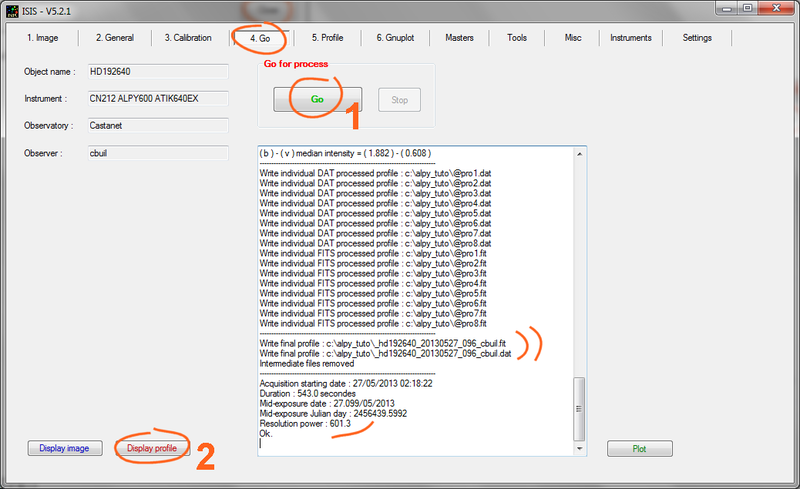 Important: The processing procedure is very similar to that used for the LISA spectrograph (see here the LISA tutorial). I described here only the main differences. 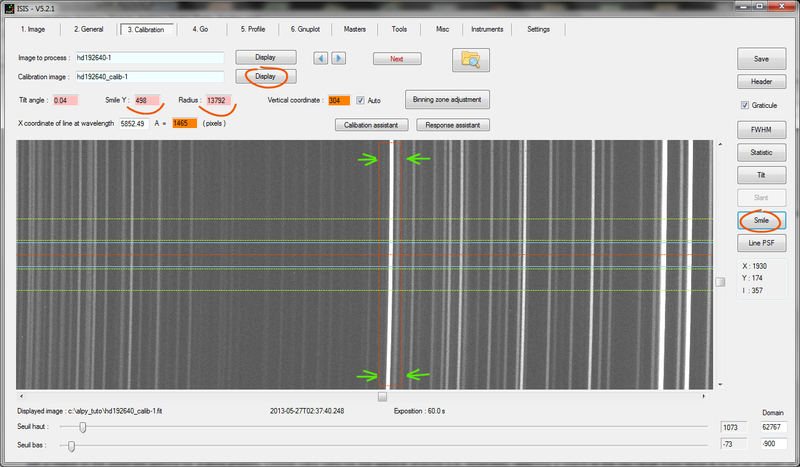 We process a sequence of 8 spectral images of star HD192640 (type A2V, a MILES star present in ISIS reference library). 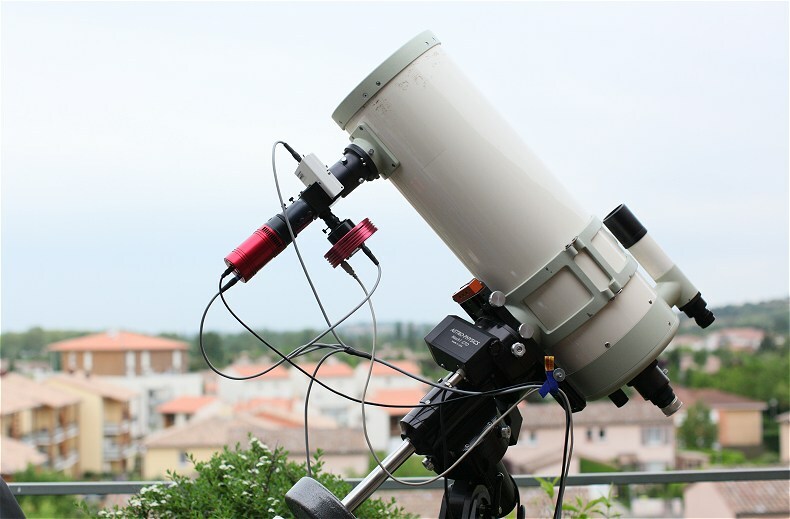 The telescope is a 200 mm f/4 Newton (Takahashi CN212). 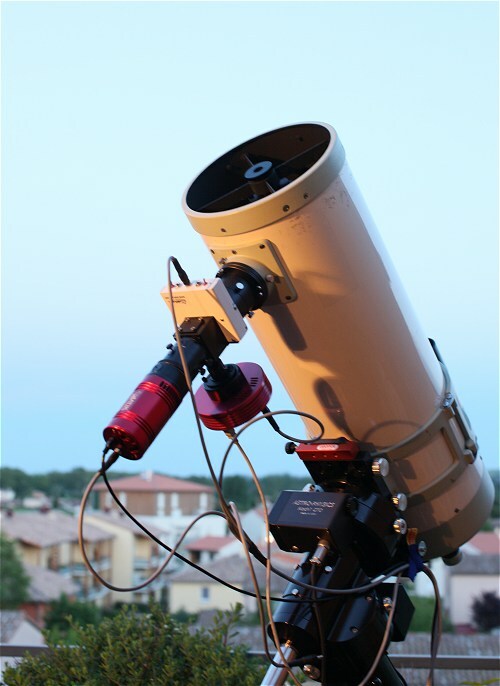 The camera is an Atik460EX used at its full spatial resolution (binning 1x1, 4.54 microns pixel size). The image "hd192640_calib-1.fit" is a one shot image of Ar-Ne spectral lamp of Alpy 600 calibration optional module (30 to 60 seconds exposure). 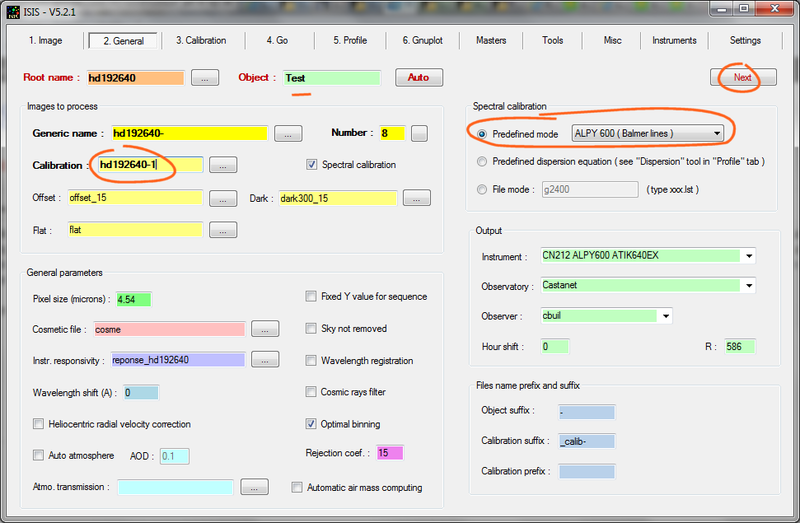 A method for calibrate Alpy 600 without the calibration module is also described in this tutorial (section 4). 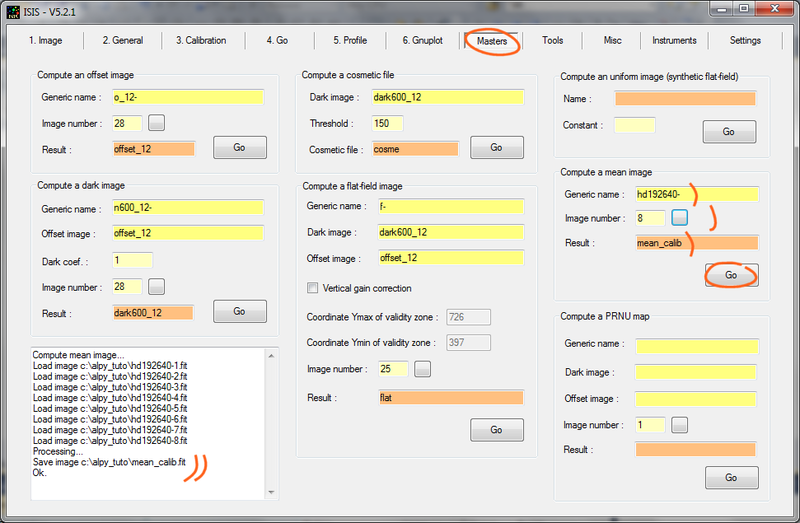 File "cosme.lst" is a cometic file (localization of hot pixels in the dark image). File "dark300_15.fit" is a dark signal reference image (mean of 18 x 300 seconds exposure in darkness). The CCD temperature is -15°C. File "offset_15.fit" is an offset image (or bias image) taken in the same condition (here, mean of 26 elementary frames). Use "Masters" tab tools for compute these reference images. It is the first image of my observational run for the star. Remenber, I use here 1x1 binning for a very well FWHM sampling and for an accurately restitution of the line profiles + minimize radiometric sampling errors. 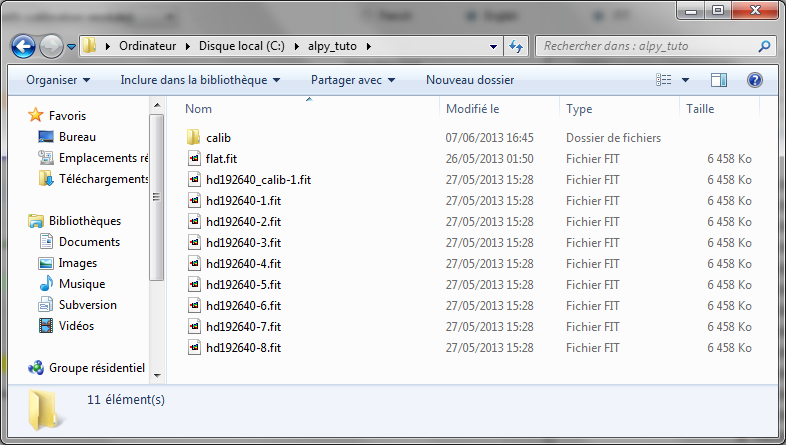 Enter the usual name of the objet, here "HD192640,", then "Next". (1) compute a mean image of the sequence. 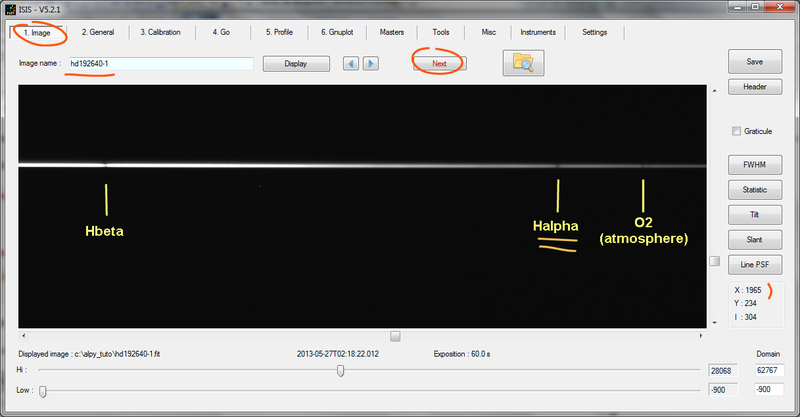 (2) double click with the mouse at the position of Halpha line in image, the fields X, Y for Halpha are completed automatically. (3) click on "Go" button. The calibration equation is computed (4th order polynom) and ISIS return the RMS error, here 0.3 A. All is OK, click "Close" button (with Alpy, max acceptable error is 0,8 to 1 A). Note: To densify the number of spectral lines and for maximal precision, ISIS uses here the stellar absorption lines to calibrate the blue part and the spectral lamp emission lines to calibrate the red part. This is the algorithm used by the wizard. 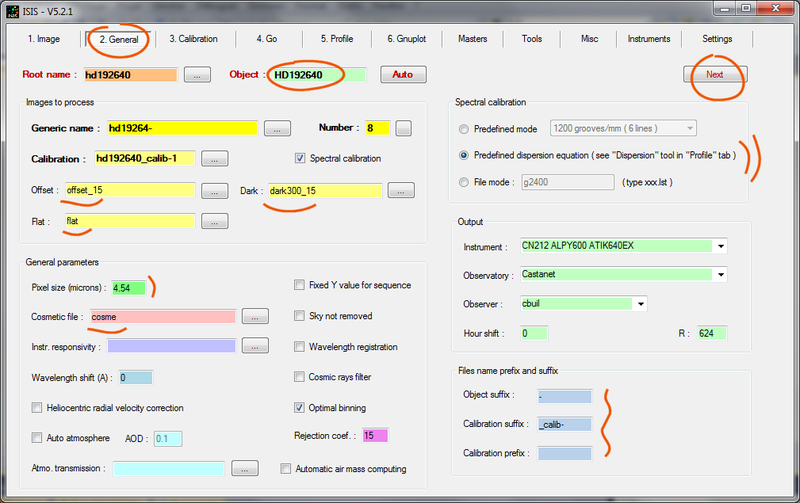 You can see here a summary of methods for calibrate Alpy 600 spectrogaph, from the simplest to the more sophisticated. It is an useful page for help you in many situations. 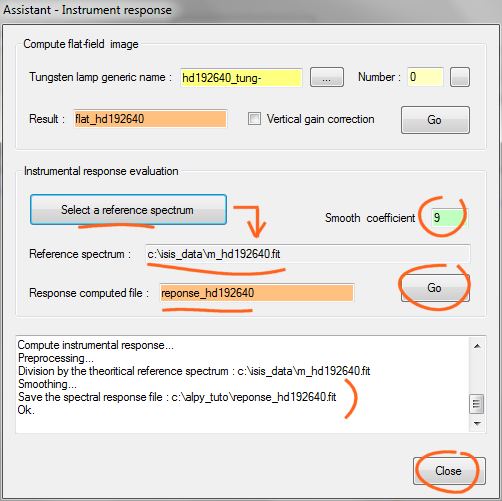 See here a large discussion about methods for compute instrumental response. The present evaluated response is not the effective instrumental response because the impact of atmospheric transmission on the result. It is a pseudo instrumental response. For process a new star, you can skip the calibration phase if objets are in same area of the sky (no differential mechanical deformations and same air mass). 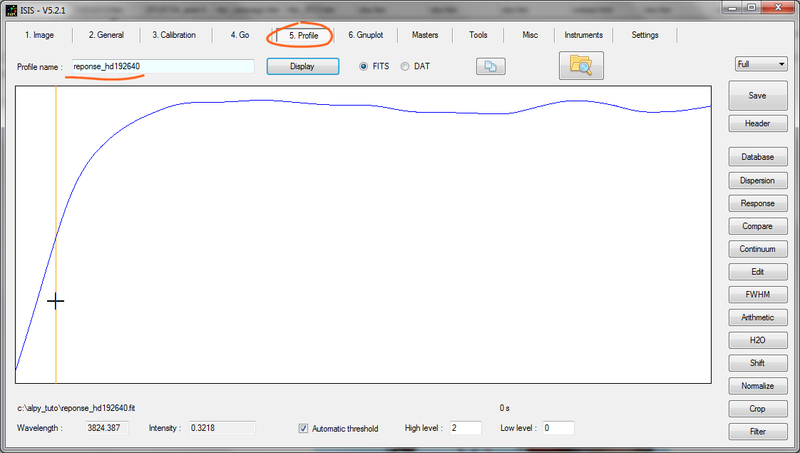 Enter just minimal parameters in "General" tab, then "Go" directly. 3. I have not Alpy 600 calibration module ! 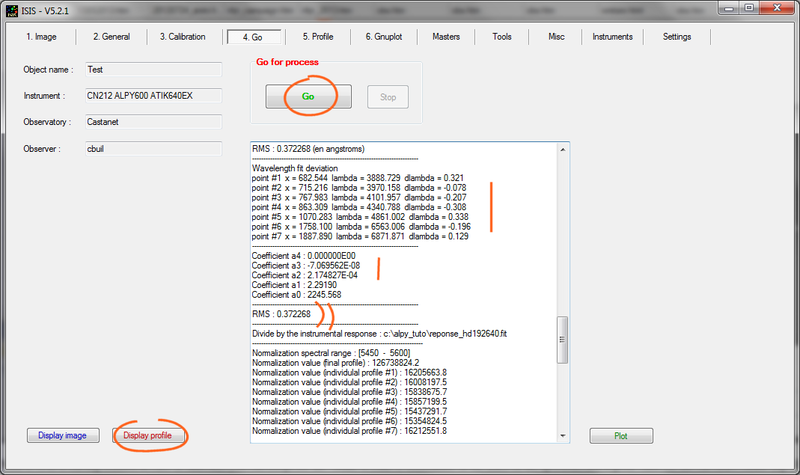 It is easy to find with reasonable accuracy the calibration equation (or dispersion) without having the calibration module. ISIS then used as a calibration source a type A star, in which the Balmer lines have good contrast. 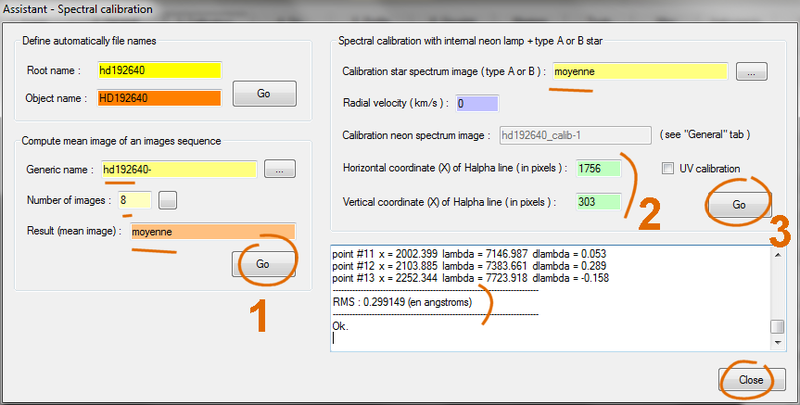 In the "Calibration" field, give the name of a raw spectrum image of a A-type reference star. In the example, I use the first frame of the sequence to be processed. But you can perfectly use the image of another star (but located if possible near the processed target object in the sky, i.e. at small angular distance). Note 1: The spectrograph Alpy is mechanically very stable. The X coordinate of the Halpha line is almost constant with the required accuracy here. Note 2: If you are not using the Alpy calibration module system you do not have an immediate solution to calculate the smile parameters. 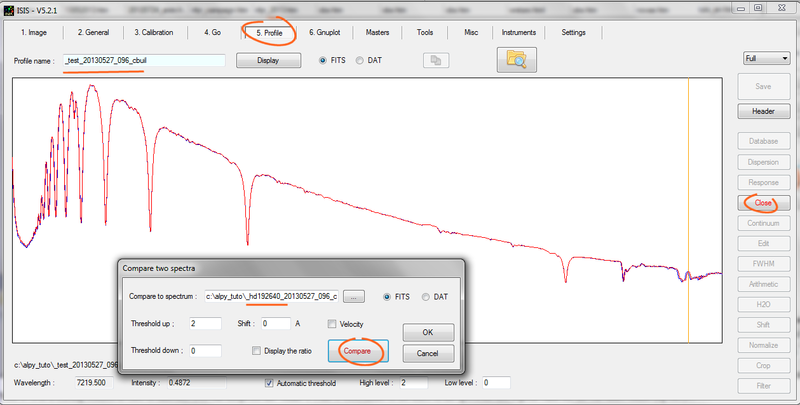 It is recommanded here to use an emission line source with a correct intensity for it. 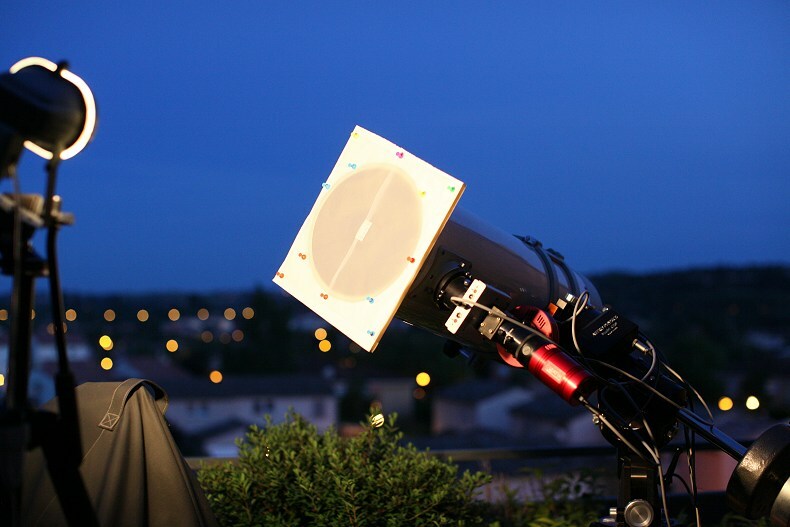 It is possible to use a line of urban pollution, a neon line in front of the telescope, a low consomation lamp (Hg lines), ...). Note 1 : For a starting solution in case of difficulty, you can adopt for the "Smile Y", the Y-coordinate of the trace of the spectrum and a large value for the curvature radius (eg 1E5). 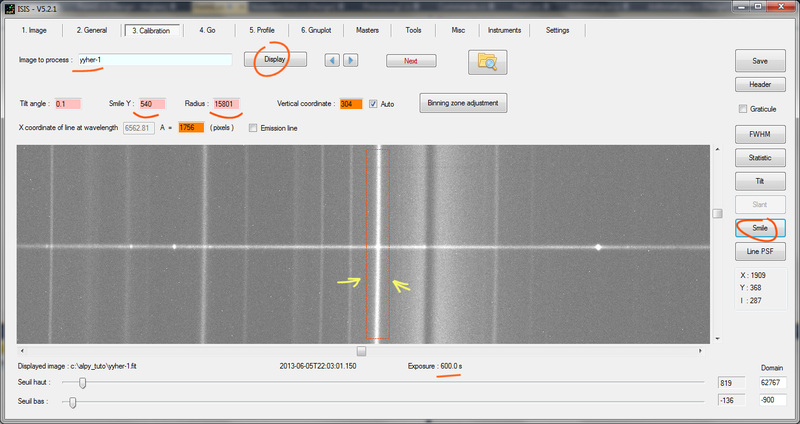 Note 2 : If the camera is properly attached to the spectrograph, smile settings are constants for your instrument! 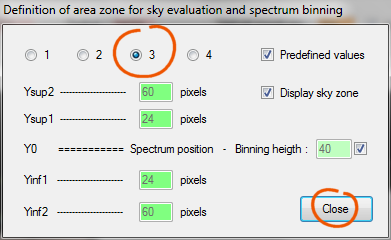 Check the residual calibration error (here, 0.37 A RMS (1 sigma), perfect). ISIS compute here a 3th order calibration polynom by using a limited number of lines (6 first Balmer lines + O2 telluric line at 6872 A). Enjoy observations with Alpy 600 spectrograph and ISIS !